Cryptocurrencies proved to be one of the biggest winners for investors and speculators in 2017. The daddy of them all, bitcoin, closed out the year near $14,000 — a gain of over 1200%. Bitcoin wasn’t the biggest winner, however. Ripple posted gains in excess of 30,000%! Cryptos can make people rich in a flash. It’s the reason for their appeal. But people need to know, there’s also a dark side to cryptocurrencies. The anonymity and privacy that makes cryptos attractive also makes them an ideal tool for crime. One of the biggest cyberattacks of 2017, the WannaCry ransomware attack, was enabled by bitcoin. More than 300,000 computers across 150 countries became infected. 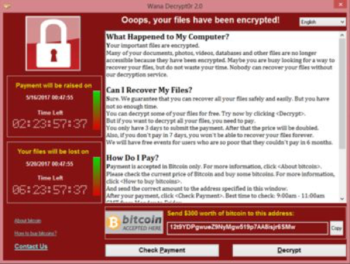 The WannaCry attacks in May 2017 sent the internet into a frenzy. The malicious software encrypted users’ computers, locking them out of their own data. The data could be made available again, but only after a payment in untraceable bitcoins. If the user refused to pay, the data would be destroyed. U.S. officials recently uncovered the source of the attack: North Korea. The totalitarian regime has found bitcoin cybercrime to be an ideal way to circumvent sanctions and fund its nuclear ambitions. Kim Jong Un wants to be a bitcoin billionaire. Crypto’s links to cybercrime and nuclear proliferation is a serious problem that needs to addressed. The potential for bitcoin-based mischief has become quite apparent and governments are reacting strongly. China for example, shutdown its bitcoin exchanges months ago. Now the country wants to shut down mining operations too. South Korea, concerned about artificial pricing, announced yesterday that it will increase scrutiny, regulation, and could soon ban all crypto trading too. The news shot the price of bitcoin down considerably. Bitcoin now sits just over $12,000 as I write. The darker side of crypto has become far too big a problem and must be addressed if cryptos are to ever fulfill their potential. But solving these problems presents huge opportunity for innovators and investors. Investigating, tracking and validating crypto transactions is going to be big business. Law enforcement is hungry for tools that it can use to trace the flow of money in order to investigate criminal activity. New advances in blockchain tech have shown we can now connect an IP address to a user, tracing all transactions by that user using the correlating address. We’re talking about the precursor to a full set solutions for investigators looking to crackdown on bitcoin funded cybercrime and money laundering. It’s a game changer for cryptos relying on blockchain networks. Already, an impressive set of clients have shown interest in this tech including Homeland Security, the U.S. Department of Justice, and the U.S. Treasury department. New blockchain tech that can eliminate the untrusted user from crypto networks presents a major game changer in the crypto space. The trend is in its infancy, but the potential here is huge. Rest assured, I’ll be tracking things closely. As new opportunities come to light I’ll be right back with another update. Since founding Agora Inc. in 1979, Bill Bonner has found success and garnered camaraderie in numerous communities and industries. A man of many talents, his entrepreneurial savvy, unique writings, philanthropic undertakings, and preservationist activities have all been recognized and awarded by some of America’s most respected authorities. Along with Addison Wiggin, his friend and colleague, Bill has written two New York Times best-selling books, Financial Reckoning Day and Empire of Debt. Both works have been critically acclaimed internationally. With political journalist Lila Rajiva, he wrote his third New York Times best-selling book, Mobs, Messiahs and Markets, which offers concrete advice on how to avoid the public spectacle of modern finance. Since 1999, Bill has been a daily contributor and the driving force behind The Daily Reckoning . Special Report:The Endless PAYCHECK PORTFOLIO: In three simple steps, unleash a steady flow of work-free income… starting with up to 75 automatic “paychecks” deposited directly into your account.